Trigger across movie and TV screen. he reigned as Hollywood's ''King of the Cowboys". Born Leonard Slye in Cincinnati in 1911, Roy dropped out of high school and left for California in 1929. After making a living as a truck driver, he learned to sing and play guitar and formed "The Sons of the Pioneers''. He sneaked into the lot of Republic Pictures and luckily was hired as a singing cowboy for $75 a week. Roy's big break came in 1938 as Gene Autry's replacement in the movie "Under Western Stars''. By the end of 1938, Roy had partnered with his golden palomino, Trigger, and was on his way to becoming the "King of the Cowboys". Roy became famous for his signature tune "Happy Trails to You'' and for about 100 films in which he played a clean-living cowboy who never got to kiss the girl. Roy became famous throughout America for having the smartest horse (Trigger), the bravest dog (Bullet), the best outfits�white hat included. He also had a girlfriend Dale Evans whom he later married, that could ride, rope and sing with the best of them. And he had a sidekick Gabby Hayes, who had the scraggiest beard. Roy, with his horse Trigger, Dale and sidekick Gabby, starred in 35 movies together along with radio and television. Roy introduced Cole Porter's hit song "Don't Fence Me In'' in the 1941 film "Hollywood Canteen". He appeared in 87 films for Republic Pictures and was the number one Western box office star from 1943 to 1954. With his wholesome image, Roy was second only to Walt Disney in souvenir sales and licensing and nearly 600 restaurants bear his name. At the peak of his fame, the Sears Catalog carried 400 products bearing his name and Roy's picture appeared on 2.5 billion boxes of Post cereals. Roy Rogers comic books sold 25 million copies a year and almost every boy in America during the 1940s seemed to go to school with a Roy Rogers lunchbox. 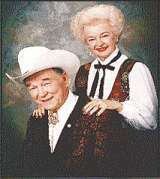 Roy Rogers and Dale Evans had 15 grandchildren and 33 great-grandchildren. Trigger died in 1965 but can be seen stuffed and mounted at the Roy Rogers and Dale Evans Museum in Victorville California. 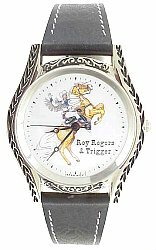 President Clinton remembered Roy Rogers as a hero to baby boomers while they were just buckaroos. Like most people my age, I grew up on Roy Rogers, Dale Evans, Trigger and Gabby Hayes,'' The President said at an appearance before reporters in the White House Rose Garden. "I really appreciate what he stood for, the movies he made and the kind of values they embodied and the good natured spirit that he exhibited all the way up until his last interviews". 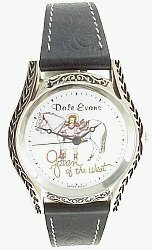 The Roy Rogers and Dales Evans Portrait Watch is an extraordinary piece of art featuring Roy and Dale in their famous poses imnprinted on the dial of the watch. 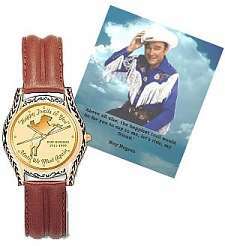 The finely engraved and enameled Western styled chrome quartz watch with a genuine leather strap has a western styled buckle and packaged in a gift box.